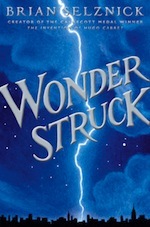 Through my intricate web of literary connections (yeah, right), I managed to get my hands on an advance copy of Brian Selznick’s brand new book, Wonderstruck. It won’t be released until September 13, 2011, so I feel very privileged to provide a sneak peek at this captivating new middle grade novel. Some of you may recall Brian’s last book, Caldecott Medal winner The Invention of Hugo Cabret, with its unique and extensive use of illustrations to complete the text. (BTW, Hugo is being released this year as a movie.) In Wonderstruck, Mr. Selznick has taken his signature style to a whole new level, incorporating over 150 more pictures than in Hugo. And this time the pictures don’t just add details to the story. They provide an entirely separate plotline, set fifty years earlier, that intertwines with and finally finishes the story told with words. It’s a phenomenal blend of image and text. Ingenious. Within, twelve-year-old Ben Wilson’s mom has just died. A search through her belongings reveals an address, an old book and the name of a man who might be Ben’s father. But before he can act, a freak event leaves Ben deaf. Despite his handicap, this information leads him on a cross-country adventure. He travels from Minnesota to New York City, following a trail that “could be traced, like a path on a treasure map, from a book, a turtle, and a cabinet in an old exhibition…and then, finally, to Ben.” By the end of his journey, Ben has learned some valuable things about himself. Wonderstruck opens our eyes to deaf culture. Ben has an advantage in that he learned to speak before he became deaf, but he struggles to communicate with folks who don’t realize he cannot hear them. Sign language becomes for him a hope-giving opportunity, and the discovery of others like him imparts a sense of belonging. This disconnection from the world is something a hearing person can hardly understand, but through Ben we “live” it.